Trek can be covered during daytime, evening or as a Night Trek, Easy trek that takes you at a vantage point from one gets a Bird's Eye View of Ambi Valley (Model Hill Station Township), Ancient fort exploration, Few old temple complexes, during monsoon and early winter the fort also has couple of small ponds, Exploring Rural countryside near Koraigad, On the way back we will also stop at Tiger Hill. Trek Grade: Easy (Suitable for beginners and children too). Experience Category: Trek easy grade climbing a hill fort (around one hour to one and half hour climb; less than one hour to descend; plus time spend exploring the fort). Best Season: the Best season is Monsoon and Winter, but is good round the year. Duration: One Day trip from Pune / Mumbai. Who is for? Families with kids / Individuals interested in getting first time introduced to trekking with an easy grade. 02:30 On the way back recommended stop at Lion Head point. Any kind of Insurance; bottled water etc. Anything that is not included is excluded. Easy Trek, Ancient Fort Exploration and Exploring Rural Countryside. 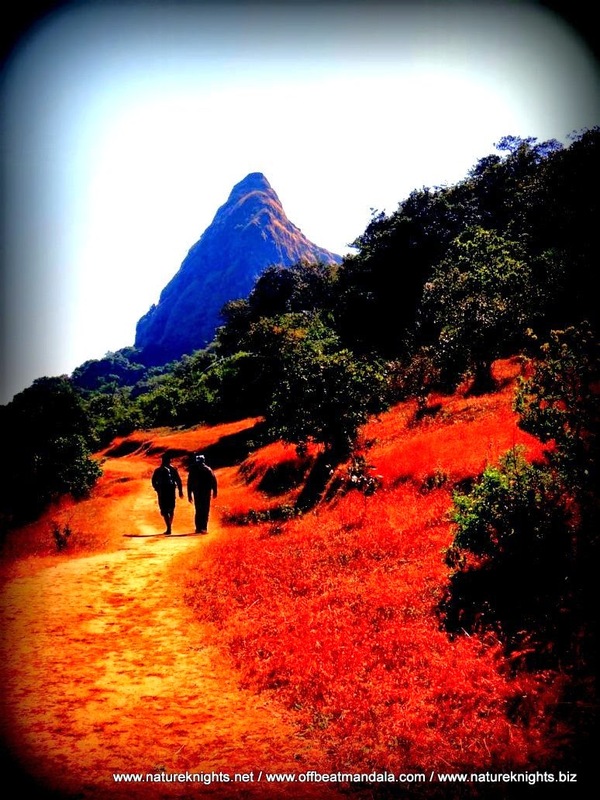 Scroll down to know more about places around Lonavala.. also if you would like to plan a custom trek for a group. Food is not included, Bottled Water or other beverages other than mentioned above not included, Tips not include. Korigad (Koraigad, Koarigad / Kumwarigad) is a hill fort located about 20 km South of Lonavala in the Maval region is the Koraigad fort which offers a panoramic view of the Deccan Plateau as well as the Konkan region. To get here you have to take the INS Shivaji road from Lonavala to Ghusalkhamb, Peth-Shahpur and Ambawawne, the village at the foothill. From here is a slightly arduous path through moderately thick forest leads to a flight of steps take you to the main entrance of fort. From the village of Peth-Shahpur you can see Koraigad hill rising like a steep wall. Its height is 3000 feet from mean sea level, but the height from peth-shahpur to the top is about 800-1000 feet. The path to the forest goes along a flat plain for quite a while before entering the forest just below the fort. From here to the main doorway is a steep climb, through dense vegetation. Among the various trees which can be found here are fig, mango, bamboo, hirda, kokum, nirgudi, karti, raanwangi, ghasodi. Occasional rare spotting of barking deer, boars, peacocks, doves are among the animals and birds found here. Half-way along the path to the left, you can see a carved Ganpati idol in a rock. Further ahead, just short of the main doorway, is a water tank, containing cool and fresh water. On entering the main door, you find a cannon lying to one side. To the left is the main gateway, the Ganesh Gate. From here far to the left, you can see the Duke’s Nose and the INS Shivaji area, while straight ahead is the Jambhuli mountain range beyond which is Tungi hill. The southern side of the fort has a temple dedicated to Koraidevi. The roof of this temple had been blown away some time ago, but now some enthusiasts have got together and had a new roof fixed. Outside the temple are two stone lamps. Inside is a four feet tall idol of the goddess. Behind the temple, adjacent to the ramparts of the fort, this is by far the largest. To the south is the well-fortified Ambavane gateway. There are two lakes on the hill where often groups of vultures hover. Visible from here are the Mulshi lake, the Bhamburda mountain and the Durga hill. The western part of the fort contains some caves and an idol of Vishnu. 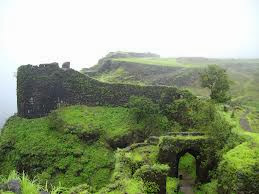 From the northern bastion of the fort, there is a panoramic view of the Konkan area. Things to explore on the fort, there are few temples on the fort to its patron goddess Koraidevi also exists along with several smaller temples to dedicated to Vishnu and Shiva. The former has been recently renovated and has a 3 foot high Deepmala(tower of lamps). The interesting part of the fort is that its wall is completely intact and one can walk along its entire perimeter(about 2 km). Its massive gate is also intact. Several ruins of older structures within the fort still exist. It has six cannons - the largest of which called the Laxmi Toph is located near the Korai devi temple.